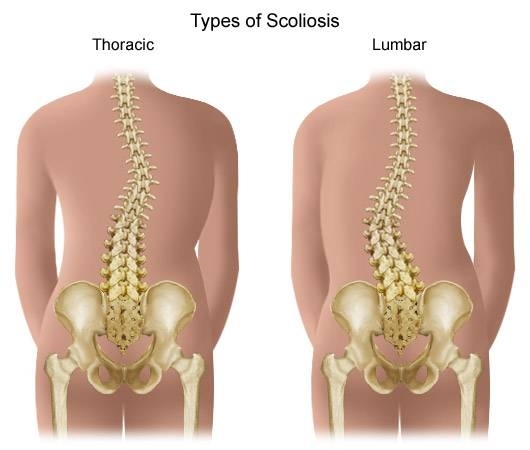 Scoliosis is a condition where the spine is either curved too far forward or backward. It can occur at any age, but it usually develops in children after age 10. 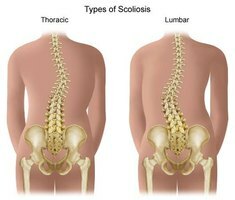 Scoliosis causes the vertebrae to twist and become deformed. As a result, a looseness and weakness can occur in the ligaments and muscles. However, there are exercises that can help stabilize the spine and alleviate pain. Yoga can work wonders for people with scoliosis. Place your elbows on a table. Allow your lower back to arch. Hold this for up to a minute. This is a good warm-up exercise. The seated twist can be done in a chair or on the floor. Simply twist your body to each side and stretch the muscles. Do 10 repetitions. The standing cat stretch: While standing, place your hands (fingers pointed inward) above your knees, bend forward and hunch your back. This exercise will stretch all major muscles and ligaments in the hips and lower back. The crocodile: Lie on your stomach and cup your chin between both hands. Prop yourself up on your elbows and hold this position. Relax. 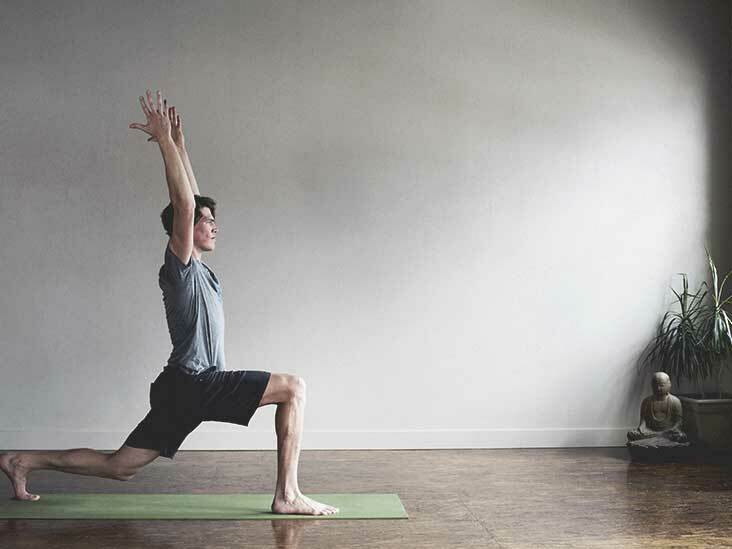 Standing-forward fold: With your legs more than shoulder-width apart, squat down with your elbows out and hands folded together. Hold this position for a minute or so, then relax. You will gradually be able to do this exercise longer. Stretching and strength-building exercises can reduce pain and correct some of the abnormal curve of the spine. Hold each movement about five seconds. Try to do 10 repetitions for each exercise at least three times per week. Do not do an exercise if it causes too much discomfort.Lower-Back Exercises:Lie on a hard surface, and let the spine align itself naturally for a couple of minutes. This will help any type of spine curvature. While lying down with your knees up, press your lower back against the floor. Relax, then repeat for the recommended number of repetitions. This exercise can enhance stability in the spine and build the muscles around it. Extend one leg. Pull the knee of the other leg toward your upper body. Repeat with the other leg. This exercise will stretch each side of the lower back. Next, pull both knees up and hold them against the chest. Let both feet fall to the floor, then repeat. Keeping your knees up while on your back, push up with your feet and lift your buttocks off the floor. This exercise strengthens the muscles between the lower and middle back. Adjacent muscle groups need to be worked to help stabilize the vertebrae in the curved area of your spine..
Kneel down on a mat and put your hands on the floor. Slowly move the left leg up and extend it backward. Bring the leg back down, then repeat with the other leg. This back-extension movement hits a number of supporting muscle groups. Leg lifts can be done while lying on the floor. With your legs extended, slowly raise them up about six inches and hold. Lower the feet, then repeat the motion. It is very important for those with scoliosis to work their abdominal muscles. Crunches are another exercise for building strength in the abdomen. Place your hands behind your head. With both knees propped up, lift your body straight up toward your legs, then return to the floor. You can try twisting to each side as you come up as well. Do not twist if it causes you more pain. Upper-back exercises should only be performed twice per week. Do up to three sets,10 repetitions each. One-arm rows help build your upper-back muscles. Kneel on a bench with one leg while extending the other one back. Grab a light dumbbell from the floor and slowly lift it up to the outer chest area. Inhale while you lower the weight, and exhale while lifting it. Seated rows can be performed at a gym or with homemade equipment. Pull the weight toward you, then take it back to the starting position. Place a chin-up bar in the doorway about waist high. Lean at an incline under the bar. Take a deep breath, then exhale as you pull yourself up. Inhale as you lower yourself back down. Previous articleSugar: should we eliminate it from our diet? Next articlePoll: How Much Do You Charge For an Adjustment?